2 Beds 2 Baths 1,069 Sq. ft.
Upstairs master bedroom with master bath and walk in closet plus a generously sized loft that can be used as an office, home gym, playroom or a den and makes this 2 story condo feel more like a townhouse! 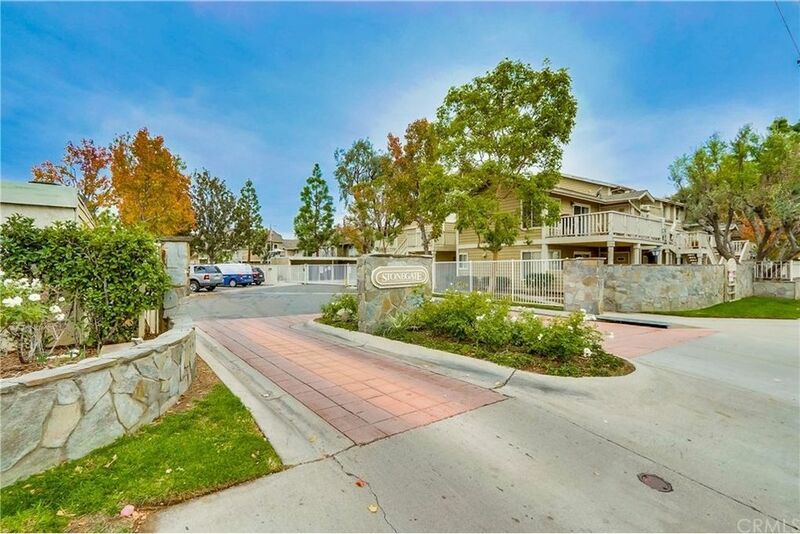 Step inside this quiet home and you'll see why Stonegate is such a desirable complex in West Garden Grove. The living room boasts beautiful laminate wood floors, vaulted ceiling and plenty of windows to let in natural light. The kitchen features white cabinets and counters with wood accents, dishwasher, microwave, a large pantry and an open view of the living/dining room. In the downstairs hall you'll find the first bedroom, a full bath and washer, and dryer hook-ups. Home boasts Air Conditioning and fresh paint throughout, this home is ready to move into! Outside you'll find a private balcony with a large storage closet with a refreshing view of the pool and spa, and the well-maintained greenbelts. This secured neighborhood is close to award winning schools, has nearby freeway access and close to shopping and restaurants. There is also a private entrance to the upstairs master bedroom and loft area making it ideal for a rental property as well.